At the Epiphany Explorations conference I really appreciated David Benner, a clinical psychologist and Christian, the founder of the Institute for Psycho-spiritual health and a professor in the States. He had a lovely presence and seemed to share from great wisdom. -- it is contemplation rather than concentration. 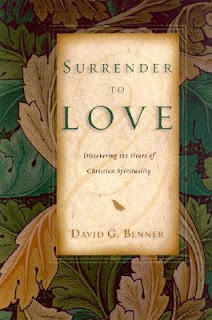 I purchased his book Surrender to Love: Discovering the Heart of Christian Spirituality because I wanted to follow his thought further. I have trouble with contemplation v. concentration. Specifically, I concentrate well (being type-A, and all) but don't make enough time to contemplate the things around me. Certainly I do it regularly, but not for long enough or to the extent that I'd like. Food for thought! Along these lines, then: I guess I should slow down and chew more as opposed to just inhaling the contents of my mental plate. It very much speaks to me David! The book sounds very intriguing and I will look for it in my local library. Being a faithful transit user throughout my school and work life, finding time for contemplation has never been a problem. Waiting for buses and travelling to my next destination; allowed me ample opportunity to think, comtemplate, read, study, make a new friend or even sleep. :) Being unemployed for this past year, has certainly been teaching me about surrendering control over how I had planned and/or hoped my life is and/or was going to proceed. I think it is after one surrenders that control, that it becomes easier to live in the present - to become totally present to the moment in which you are currently living in and in which one can fully live with all your senses. For me, major life changing events such as: illness, death of a close family member, or a significant loss; has brought about contemplation and learning to live in the present and the piercing of having control over one's life. yet yours is the word I need. let it enlarge my wonder. This speaks to me too. Every morning, before I do anything else, I sit contemplating by the window and just listen to the silence of the house. I am disappointed if for some reason I can't begin my day this way. I have to get up earlier than the rest of my family to do this, which I almost always do. This has always been my favourite time of day. I need this more than caffine. I share a few phrases with you, and it evokes many thoughts. Thanks to all of you.